The essential tools of birding are optics and a field guide. A strong sense of curiosity helps, too! As a hobby, one of the best things about birding is ease of entry. The only essentials are a pair of binoculars and a field guide. For $100 or even less, you could start building your life list today. May, in fact, is an ideal time to begin. In this region, no other month can match the color, variety and pure excitement of May. Experienced birders know it, and most of them are eager to introduce others to the avian spectacle rolling out now in our suburban yards, parks and forest preserves. I’ve always found the local birding community to be inclusive and welcoming. Birders enjoy sharing the hobby. Of course I didn’t know that when I was just getting started. I felt a little alone, not realizing I’d stumbled into something enjoyed by 50 million other Americans. Everything was new, like the hooded warbler that sparked my interest in 1994. Twenty-two years later I wouldn’t call myself an expert birder. “Advanced intermediate” seems about right, and I’m constantly learning. But I do feel qualified to offer the following nuggets, intended primarily for beginning watchers who (like most of us) are still figuring things out. 1. You’ll get some funny looks. Despite its immense popularity, birding still feels a little outside the mainstream. It’s cooler than it used to be, but the dork factor hasn’t faded away just yet. Outsiders may regard you with suspicion. Be careful when using binoculars at the beach or in the backyard. It’s good to tell the neighbors what you’re up to. 2. Age doesn’t matter. The hobby skews older, for sure, but a solid contingent of teens and 20-something birders possess off the charts birding skills. Their eyes and ears seem to work better, or maybe they just study harder. If you find yourself on a bird walk with one of these young guns, stay close to them and prepare to be amazed. 3. Decent binoculars are available for $125 or less. Last year I followed up on a magazine article about small, lightweight optics by purchasing Celestron Nature 8x32s for $111, tax and shipping included. They’ve surpassed my expectations and could be my primary binoculars in a pinch. If you can spend more, especially for your everyday glass, do it. About $300 is plenty. The go-to source for birders is EagleOptics.com. 4. This isn’t so hard. If you have a fledging interest in birds, you know more than you think. Building on what you already know happens quickly if you put in the time. Take a walk or sit on the back patio. Look and listen. Start with the common birds and go from there. Join an organized bird walk; nothing elevates your skill level faster than birding with others. 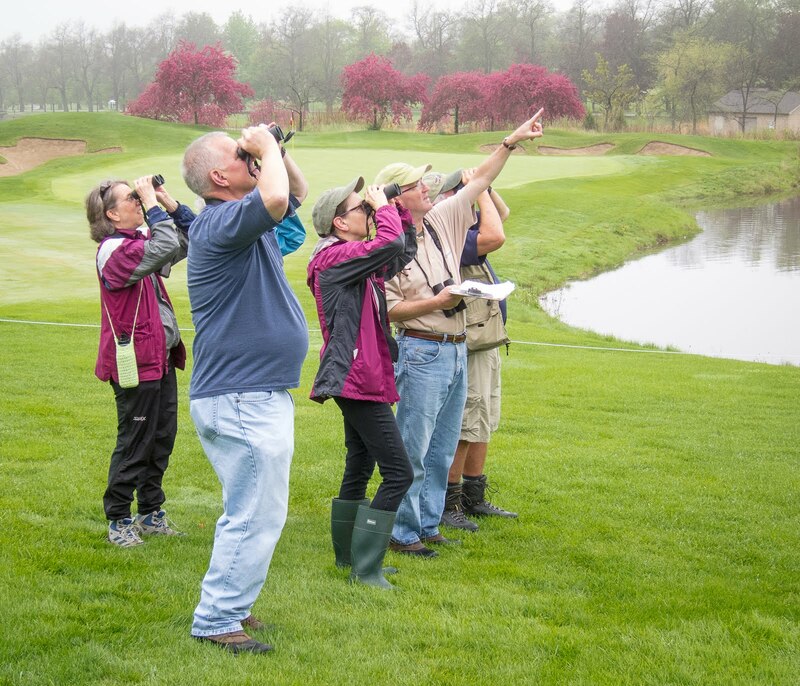 For instant camaraderie, check out the DuPage Birding Club or Kane County Audubon. Both groups conduct field trips and non-members are welcome. 5. Birds are predictable. Most birds migrate, and we know when to expect them in the spring and fall. We also know where they are most likely to be when they visit. Learning seasonal patterns and habitat preferences is essential to your birding education. You’ll begin to associate certain months or locations with specific species. 6. You can bird any way you want. You have choices. Keep a list or not, or keep 50 lists. Get up early or sleep in. You don’t have to memorize the plumages of immature gulls or learn the songs of every wood warbler. Bird alone or with others. Hit the trail or watch the feeders from your kitchen table. Your field guide can be a smart phone or a dog-eared Sibley with coffee stains. Choose the birding style that’s right for you and keep it fun. 7. The more you want to see a bird, the better your chances of seeing it. It’s motivating to have a few target birds. Like Waldo, you will find your first orchard oriole if you keep searching. Make it your mission. Do the research. Follow internet postings. Ask around. 8. “Nemesis birds” will haunt you. This is the nasty corollary to the previous point. It’s just a cold, hard fact that bad luck or poor timing will prevent you from ever seeing a certain species—usually the one you want most. For me it’s the worm-eating warbler, and in Florida, mangrove cuckoo. I’m exaggerating of course. The Moment will come, for me and for you. Patience. 9. Sometimes the bird gets away. This is another common frustration, and not just for newbies. You may only get a two-second peek at a species you’ve been coveting. Worse, the quick view might not be enough to make a positive ID. Or maybe you later realize what you probably saw but can’t be 100% sure. Go back if you can, but otherwise just learn from the experience and be ready for next time. 10. The Honor System applies. There’s a sequence in “The Big Year” (my favorite movie) when Owen Wilson talks about birders who cheat. Using a golf analogy, he says, “Everybody in the clubhouse knows which guy cheats on his score. He’s kind of pathetic. Who’d wanna be that jerk, right?” (Only he didn’t use the word jerk.) Nobody I know would ever break the sacred trust of birding and report something they didn’t actually see. I love that about our hobby. 11. Ethics matter. Besides being honorable, birders are expected to behave responsibly. We do not trespass on private property and we don’t create stress for birds by getting too close or playing recorded bird sounds during the breeding season. At any time of year, it’s best to minimize the use of sound devices. Some venues don’t allow them at all. Take a few minutes to review the American Birding Association’s Code of Ethics, online at aba.org. 12. We are conservationists. Birders love the thrill of seeing something new, going to new places and just watching the birdlife change with the seasons. These are the hobby’s recreational drugs. But there’s a high degree of give-back inside the community, too. We donate a few hours or dollars when we can. We buy duck stamps, create healthy backyard habitats and keep our cats indoors. We support local organizations like the Conservation Foundation, Illinois Young Birders and Willowbrook Wildlife Center. We’re joiners on the national and international level, too, sending our dues (and used binoculars) to the ABA and perhaps writing a check to the American Bird Conservancy. You get it, I know. The birds come first. Let’s get outside this month and enjoy them!